Compared to the rest of the United States, electricity prices in New England are high. Nothing surprising there. So, just how expensive are they? Well, it depends. And, the surprising part is which utility, in one comparison, has the lowest rates. Eversource Energy is an investor-owned utility headquartered in Hartford, CT and Boston, MA. Eversource is the rebranded name of Northeast Utilities, after its merger with NSTAR in 2012. Through its three electric distribution companies, Eversource operates New England’s largest energy delivery system and has 3.2 million electricity customers. United Illuminating Company, a subsidiary of Avangrid, Inc., is an electric distribution company serving 325,000 customers in Connecticut. Avangrid, through its four electric utility subsidiaries, serves about 2.2 million customers in New England and New York State. Wallingford, Connecticut is a town of 45,000 people located between Hartford and New Haven. Despite its size, the town operates its own municipal electric utility, known as the Wallingford Electric Division (WED). Despite operating in the same geographic area, the three utilities vary dramatically in terms of their rates and the costs to their consumers. A recent bill insert sent out by WED provided the following rate comparison. These are residential rates for an account that averages 750 kWh per month. 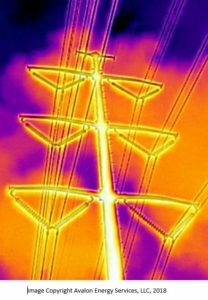 Utilities have different energy procurement strategies and different infrastructure issues, which contribute to their varied pricing. Furthermore, municipal electric utilities are exempt from certain mandates that affect the pricing of larger utilities. 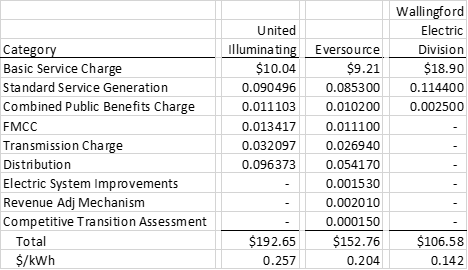 However, the 6.2 and 11.5 cents per kWh differences between a small municipal utility and the two large investor-owned utilities are dramatic. Note: The WED bill insert was provided by Dan McDonnell of Wallingford, CT. The Avalon Advantage – Visit our website at www.avalonenergy.us, call us at 888-484-8096, or email us at info@avalonenergy.us. Propane is a versatile source of energy common in rural areas that are “beyond the main” of utility natural gas service. It is often used for home space and water heating and cooking, as well as for agricultural uses such as crop drying, irrigation pump fueling, space heating in green houses, pig and poultry brooding, frost protection, standby electricity generation, and even food refrigeration. Propane is produced in association with natural gas (along with other natural gas liquids, or NGLs) and is also a byproduct of crude oil refining. Because propane is a gas at atmospheric pressure, it is compressed into a liquid state under moderate pressure for storage and delivery. The shale gas revolution has led to dramatic increases in natural gas production. As previously reported, US natural gas prices have remained low for some time. 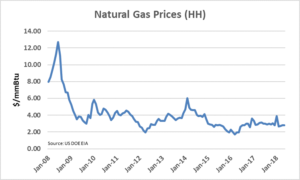 This is despite the existence of many influences that more recently would have driven natural gas prices upward (see Natural Gas Market Update, June 2018). 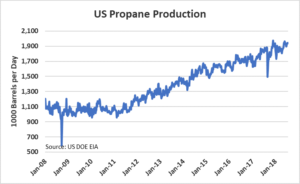 Because propane is produced in association with natural gas, along with the dramatic increase in US natural gas production has come a dramatic increase in US propane production. As natural gas production has increased, so has NGL production. 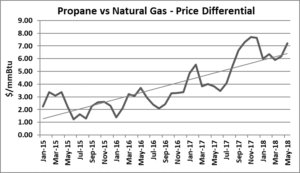 With such an increase in propane supply, propane prices, like natural gas prices, are low – right? While natural gas prices have remained low (red line below), propane prices have risen significantly (blue line below). 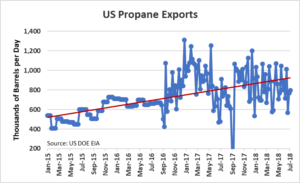 Exports of propane from the US have grown and continue to grow. 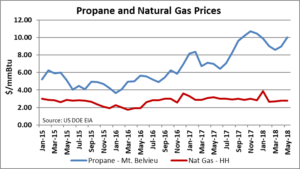 Rural residential and agricultural customers who rely on propane rather than natural gas are not benefiting from the shale gas revolution to the extent that others are in the US. Increasing propane exports are a major driver of this phenomenon. This is another illustration of the complicated dynamics underlying energy commodity markets and an example of how those markets can change over time, often in unexpected ways. Note: Evelyn Teel contributed to this article. 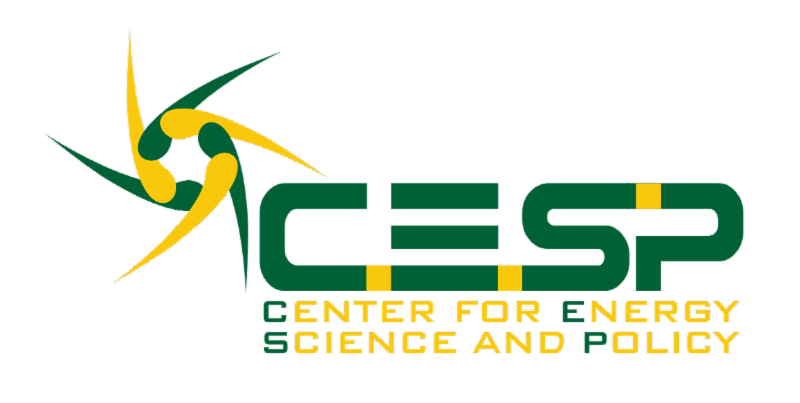 Bloomberg recently noted that in an upcoming report, the USGS more specifically identifies a stretch of the Interstate 95 corridor as particularly at risk of power outages related to geomagnetic storms. This corridor is largely underlain by Paleozoic (very old) crystalline rock that acts as an insulator, reflecting back incoming energy from the sun, thus giving that energy a second chance to damage utility infrastructure. Damaged electrical infrastructure, particularly utility transformers, can take many months to replace. Putting aside for the moment the notion that rocks can be inherently good or bad, concerning how this connection between electricity and rocks may impact the electric grid, solutions are not simple. Some may look to off-grid self-generation and battery storage for protection. But, if a geomagnetic storm is strong enough to impact the grid, it also may impact the electric infrastructure at individual customers’ sites. Faraday cages are a potential solution. Faraday cages also may provide protection against EMPs (electromagnetic pulses). More on this in the weeks ahead. Evelyn Teel, Ralph Russell and Jeff Dowdell contributed to this article. The Avalon Advantage – Visit our website at www.AvalonEnergy.US, email us at info@avalonenergy.us, or call us at 888-484-8096. How can you capitalize on the growth promised by the Marriott headquarters and hotel? What type of tenant is ideal for Carr’s Apex Building? Will Bethesda ever see a nightlife scene? Does it want one? With a historically strong retail market, is Bethesda immune to the asset class’s national uncertainty? How can Bethesda develop a unique identity as a suburb of DC? Find more information about this exciting event here. Friends of Avalon Energy Services can receive 20% off the price of admission by using the following code: AES20UZ1A5. As previously announced, Avalon Energy Services is also co-sponsoring Bisnow’s July 24 event, “Baltimore-Washington Industrial & Logistics Forecast: How Quickly is the Market Actually Growing and Can You Capitalize on It?” Check out our previous post for more details and the Avalon Energy Services friends’ discount code. With more and more companies adapting to an e-commerce model, are they prepared for the industrial world? Are they making educated decisions in their industrial moves, leases and logistics? As more developers grow their industrial portfolios, will this create healthy competition for the marketplace? How will the trucking labor shortage impact drayage costs? Will self-driving vehicles play a role in shipping? As vacancy rates continue to decline, how high will rent rise? Is there a chance we are over estimating e-commerce’s growth, or will its exponential growth continue as expected by many? Find more information about this exciting event here. Friends of Avalon Energy Services can receive 20% off the price of admission by using the following code: AES20S31XL. 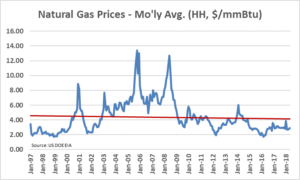 Natural gas prices remain low and below their declining 21-year trend. See graph below. The prices presented here are for delivery at the Henry Hub in Southern Louisiana. Natural gas prices in other producing areas of the US, such as Northeastern Pennsylvania, the Permian Basin, and the Williston Basin, are significantly lower. The prices here are also in nominal dollars. If plotted in real dollars, the downward trend would be even more pronounced (see These are Days to Remember). Given these influences, how do natural gas prices look in the futures market? Low and continuing their decline. See the graph below. 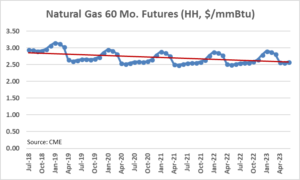 After peaking at $3.16/mmBtu during the winter of 2018/2019, natural gas prices remain below $3/mmBtu for the remainder of the 60-month forward period. Supply. More specifically, dramatically increasing supply. 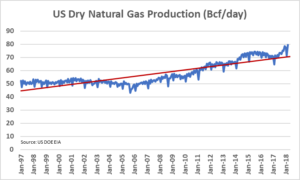 Natural gas production is up 7 Bcf/day from this time last year to 79 Bcf/day. 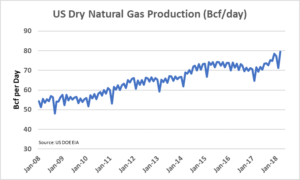 The US Energy Information Administration (EIA) projects US natural gas production will reach 83 Bcf/day by December 2018. Natural Gas Prices – Time to Hit the Panic Button? As a result, natural gas (and electricity prices) are currently attractive—making this a good time to consider locking in your supply needs. The Federal Energy Regulatory Commission approved a change in PJM’s (the Mid-Atlantic grid operator) tariff, allowing them to shift what are called “balancing congestion” costs to load serving entities. FERC approved PJM’s tariff revision with an effective date of June 1. Suppliers have indicated that they intend to pass through these charges. Suppliers include a change of law or regulation provision in their agreements. Basically, they commit to a fixed price, but allow for pass-throughs when there is a change in law or regulation. Please email or call to discuss the potential impact of these charges to you. 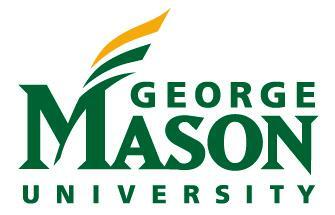 9:00 a.m to 6 p.m.
Take the Orange Line to the Virginia Square/GMU station. The Arlington Campus is approximately 2 blocks. Take the escalator to the street level, and turn to face Fairfax Drive. Across the street and to the right, you will see the FDIC building. Cross the street and continue past the FDIC building. The Arlington Campus is on the left. Last week, the Maryland House and Senate voted to override Governor Larry Hogan’s 2016 veto of the 2016 Clean Energy Jobs bill. 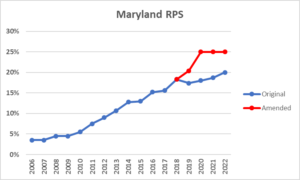 As a result, Maryland’s Renewable Energy Portfolio Standard (RPS) will increase from 20% in 2022 to 25% in 2020. The graph below shows the effect of the original RPS rule in blue overlaid with the newly amended rule in red. 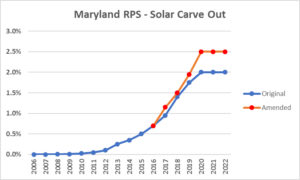 Maryland’s solar “carve out” will increase as well as shown below. Regulatory guidance is that customers with executed retail electric contracts in place prior to the effective date of the override are grandfathered from the additional RPS costs until the expiration of the grandfathered contract. This is a good time to consider extending your electricity supply contracts to year 2021.